Figure 1. 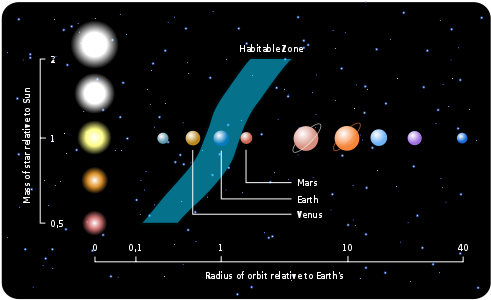 Diagram showing the habitable zone of our solar system, and how it shifts depending on the type of star at the center of the system. Astronomers and non-astronomers alike are eager to find Earth-like planets in the habitable zone, or the orbital distance around a star that allows for liquid water on a planet’s surface. As seen in Figure 1, this is usually calculated by simply looking at the star’s spectral type and the distance of the planet to its star, which tells you roughly how much energy a planet receives, and therefore whether it can maintain a surface temperature between the freezing and boiling points of water. But distance to the star is only the first piece of the puzzle: details about the planet itself play a huge role in setting the habitable zone boundaries. These planetary details can include the composition and structure of the planet’s atmosphere and its cloud cover—and cloud cover is in part determined by the planet’s rotation rate. In this paper, Yang et al. use a circulation model to study the effects of different rotation rates on cloud formation, and by extension its effects on the habitable zone boundaries. Figure 2. Differences in clouds and atmospheric circulation between rapidly rotating (left, 1 day) and slowly rotating (right, 128 days) planets with an orbital period of 365 days, with data averaged over 30 day periods. Panels a-d show two different stellar flux levels for each rotation, with colors representing cloud coverage, while contour levels show temperature. Panels e-h also show two different stellar flux levels for each rotation. For these, colors represent relative humidity while vectors represent near-surface winds. In all right panels, the black dot is the transient sub-stellar point, which moves westward around the planet with a period of 197 days. Credit: Yang et al. 2014. Many of us tend to naively think that planets with very thick atmospheres are bad bets for habitability because of Venus’ famous example in our own solar system. Venus’ well-known runaway greenhouse effect has indeed made the planet very inhospitable, but it turns out that thick cloud cover can be beneficial to close-in planets. A planet with a high albedo will reflect a large amount of starlight off the top of its atmosphere, thereby protecting the underlying layers from ever absorbing much of the stellar flux. This can allow very cloudy planets to have habitable zones much closer to their stars than cloud-free planets. But what makes some planets cloudier than others? It turns out that a big part of the answer is how quickly a planet rotates. A planet’s rotation rate obviously determines the length of a day on that planet. Planets with long days and nights will have large temperature gradients and atmospheric circulation that is driven by warm air rising on the day side and falling on the night side, while planets with short days and nights will have smaller temperature differences. Additionally, quickly rotating planets will have a strong Coriolis force, which breaks up latitudinal (equator to pole) circulation into narrow bands called Hadley cells. Slowly rotating planets have a weak Coriolis force that results in global Hadley cells. Both of these effects have strong predictive powers for how clouds form. See Figure 2 for reference. Notice in particular that a slowly rotating planet forms more clouds (i.e., is redder in the figure) when stellar flux increases, while a quickly rotating planet forms less clouds. Even better for hot conditions, the clouds on the slower planet form primarily at the sub-stellar point (marked as a black dot on the figure) where incident stellar flux is strongest, cooling the planet right where it needs it most. The authors use a 3D general circulation model that was built to model Earth’s climate, and study what happens if you change the planet’s rotation rate and/or the kind of star the planet orbits. They compare this to simpler 1D radiative-convective atmospheric models that ignore atmospheric changes with latitude and longitude. Their results are shown in Figure 3. 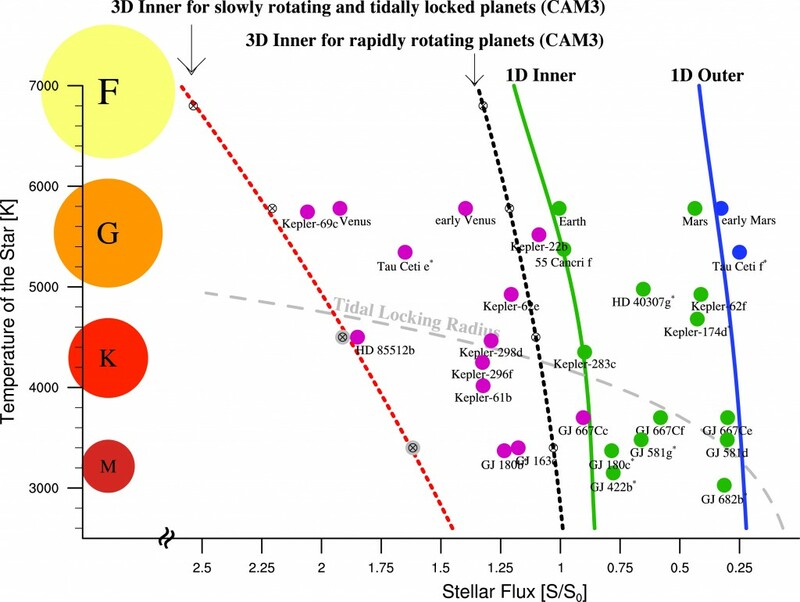 For planets that rotate slowly enough to be tidally locked (the red line in Figure 3), the authors find that including clouds can allow these planets to receive twice the stellar flux that the 1D models predict and still remain habitable. 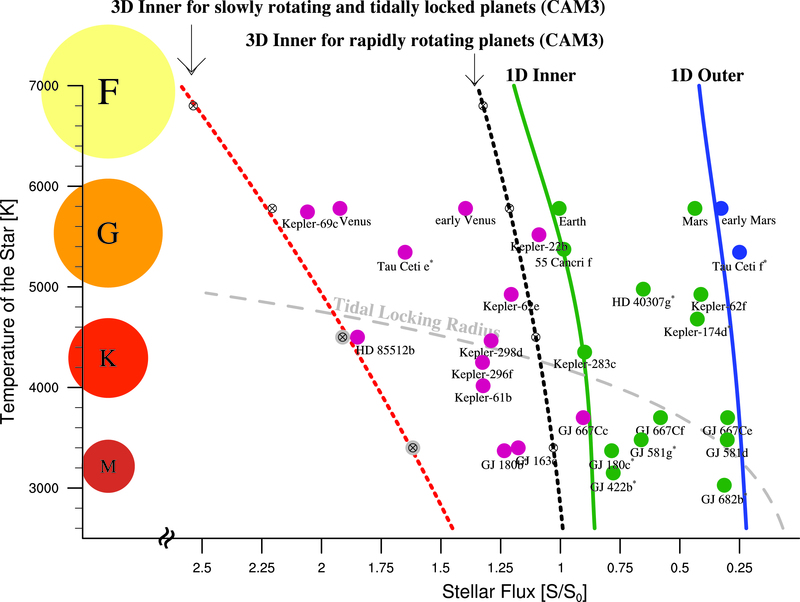 Figure 3 shows that all the purple planets, which would be considered too hot by conventional metrics, could be considered in the habitable zone if their rotation rates are slow enough. Of course, not all planets that rotate slowly now did so throughout their history, and the authors warn against taking their results at face value; a planet’s history has as many implications for its habitability as its current status. But since it’s much easier for astronomers to find and especially characterize planets closer to their host stars than farther away, this has big implications for our ability to study planets in the habitable zone. Figure 3. Habitable zone boundaries are plotted for 1D and 3D atmospheric models, as a function of stellar type and stellar flux. Also plotted are various exoplanets and solar system planets. 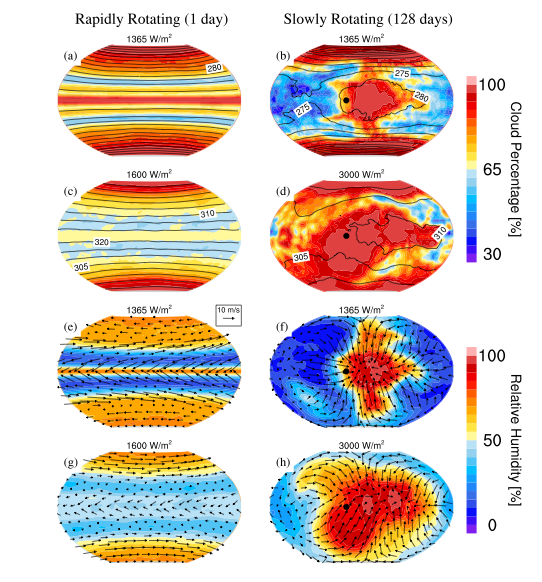 3D models that include clouds allow planets to receive much higher flux rates than 1D models. Credit: Yang et al. 2014. I'm a fourth year grad student at George Mason University, and I work with Avi Mandell at NASA Goddard, where I characterize hot Jupiters by studying their transits. I did my undergrad at Macalester College, I like travel and cooking, and I love doing outreach to get other people as excited as I am about astronomy. This is an important study with a robust hypothesis . I found it both interesting and thought provoking. Thank you. I have read the unabridged paper on arXiv as a result. As an amateur astronomer with an interest in astrophysics my knowledge of theory is obviously limited to that of a professional astronomer , but an academic background in medicine allows me to focus on the generic design aspects of the trial. I have two concerns. The first is that in the method section there is no mention that those investigators tasked with analysing the data of either the exoplanet accompanied or comparison star were “blinded” as to which group they were looking at. A fact that is crucial to the whole trial ,results and their interpretation.Given the team’s background in this type of work and knowledge of other work in this area could potentially introduce a strong bias to any interpretation of data should they be alert to the presence or absence of an exoplanet accompanying the star whose X ray status/age they are analysing. This sort of trial design is common in medicine too, where blinding “raters ” to the nature of which of the two investigational groups they are assessing would be the norm . With good reason ,as without it the whole outcome could be challenged. I’m surprised there was no blinding process described by the authors or indeed whether there was any. My second concern is the size of the study . Although the small numbers involved is to some extent acknowledged by the authors, given the strong assertion of the results and their significance , there is no recognition that the findings could be due to chance . I cannot see any mention in the method of any “power” calculation done . This is a statistical process by which the expected hypothetical effect under analysis ( the effect of an accompanying exoplanet on the perceived x ray determined age of a star) is used to calculate the number of subjects /stars required in each group to ensure that any results are due to the hypothesis effect rather than merely chance. In small studies like this its not unusual to just use the results to illustrate a non statistically significant trend that requires further investigation ( the authors mention this) , but this should be recognised. This is a well chosen and very counter intuitive paper that attempts to challenge several preexisting concepts of the erstwhile “planetary habitable zone” initially conceived in Kastings seminal 1993 paper. It is based upon computer simulations of how planetary surface temperature could vary according to rotational rate for a variety of stellar fluxes. Given the huge potential for the findings; I.e that lower rotation increases cloud cover and thus planetary albedo ( especially at those lower latitudes receiving higher flux rates) which in turn helps reduce surface temperature allowing the habitable zone inner edge to shrink towards the star; I’m surprised that it appears to treat stellar flux and planetary rotation rate as being independent . Tidal locking of a planet is dependent on many factors including time, but mostly on semi major axis . I.e it happens sooner the smaller this is. Stellar flux obeys the inverse square law and is also heavily dependent upon semi major axis . As this reduces , stellar flux increases,. Conversely planetary rotation rates reduce as they are slowed down by the proximity to the parent star. It also assumes that stratospheric water vapour content is low ( a critical factor in photo dissociation , the process by which water is broken into its comment elements by high energy starlight at altitude , and its hydrogen subsequently lost to space thus contributing to loss of water. The liquid presence of which is the key element to Kastings original habitable zone hypothesis .) which would be hard given the high water content of any extra clouds postulated to occur on a hypothetical planet near the inner edge of the habitable zone. My final concern is that low planetary rotation rates would impact on the critical magnetic field ,which is produced by a dynamo effect created by rotation of an outer liquid iron core, and is required to protect any atmosphere from the “stripping” action of the stellar wind, and especially its interaction with any higher , cloud containing layers . This does not appear to factored into the simulations. I’m as keen as anyone to discover life elsewhere , and the more “habitable” planets the better, but there are various methodology issues that need addressing with this papers simulations before its findings can be substantiated.